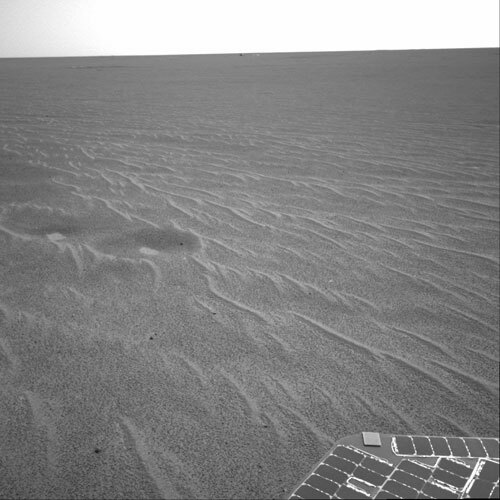 This image from the Mars Exploration Rover Opportunity is part of the first set of pictures that was returned to Earth after the rover exited "Eagle Crater." 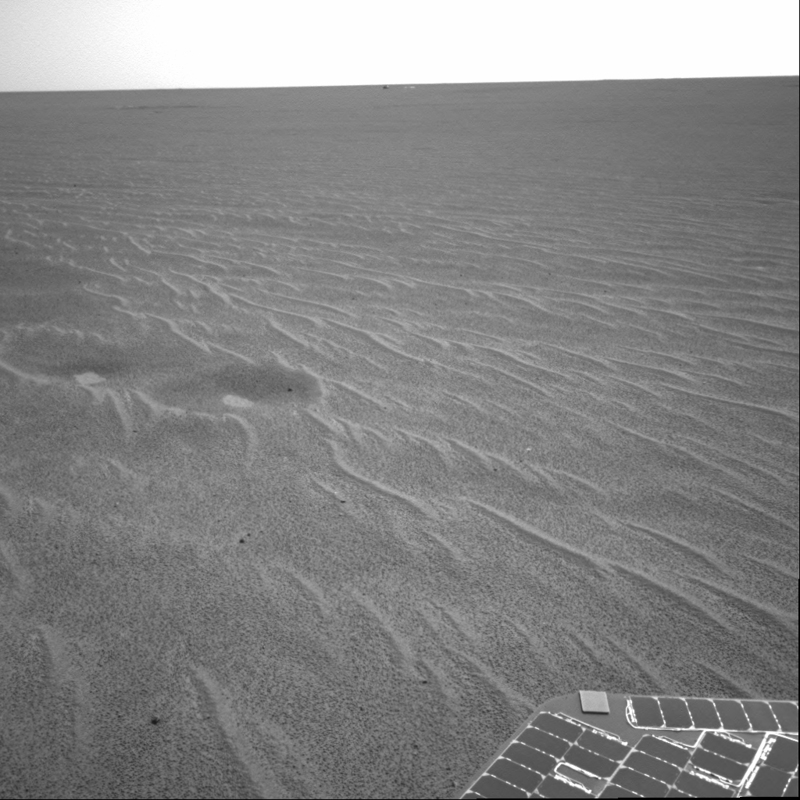 Scientists are busy analyzing Opportunity's new view of the plains of Meridiani Planum. The plentiful ripples are a clear indication that wind is the primary geologic process currently in effect on the plains. On the left of the image are two depressions -- each about a meter (about 3.3 feet) across -- that feature bright spots in their centers. One possibility is that the bright material is similar in composition to the rocks in Eagle Crater's outcrop and the surrounding darker material is what's referred to as "lag deposit," or erosional remnants that are much harder and more difficult to wear away. These twin dimples might be revealing pieces of a larger outcrop that lies beneath. The depression closest to Opportunity is whimsically referred to as "Homeplate" and the one behind it as "First Base." The rover's panoramic camera is set to take detailed images of the depressions today, on Opportunity's 58th sol. The backshell and parachute that helped protect the rover and deliver it safely to the surface of Mars are also visible near the horizon, in the center of the image. This image was taken by the rover's navigation camera.